Two years ago we brought both of the girls to Rockport for Norah's first trip to the beach. She was just over a year old and was as itchy as ever. The first day we went to the beach, Norah sat in the cool water and giggled and squirmed. This was new for her and she loved it. She had rarely been in a pool because harsh water conditions and bacteria posed a serious threat to her skin, but this she loved. Admittedly, I was worried about the toxicity of the water (being the Gulf of Mexico and all), but (despite many accusations of just keeping her away from "fun things" for my own benefit) I was willing to let her try it out at least once. The patches on her skin turned bright red as she played and I held my breath. We all were amazed as tiny little minnows came up to her legs and ate off the dead skin- and she let them! As we packed up to leave I prepared myself to come home to The Itchy Kid, having left Happy Smiley Beach Baby back on the shore. What we found was just the opposite. The salt water had taken away all irritation. The patches were no longer raised or inflamed, her skin was (for the first time in her life!) somewhat smooth, and she seemed to momentarily forget that she was usually in pain and cheerfully played the rest of the day. When Norah has a bad reaction to something, we often stick her in a bath with some Epsom salt and essential oils with minor results so this was huge. We rearranged our entire trip to get her in the water as much as possible that weekend. We even considered bottling up the ocean and bringing it back with us to Fort Worth, but knew the stagnate, contained conditions would spoil the water. Fast forward to a year later when we moved to Rockport. One of the (very few) things we were excited about getting our tiny lady out to the beach as much as possible. We couldn't apply sunscreen to her skin because everything we found triggered histamine release (this year we will be using coconut oil and carrot seed oil!) so we went to the beach at sunset and let Norah play every few days. Being in homes that were full of things that make her sick was very, very rough on her little system, but the salt water still worked magic for her. Fall, then winter came and went. Though the weather was mild, it was still too chilly to get in the water. But spring is here. The water is warming, the sun is out. A few weeks ago we took the girls out for their Nature Study Day. Since the fishing was supposed to be good, we headed to the beach. The water was still chilly, but not so unbearable as to keep you from ankle wading. We ventured under the pier looking for hermit crabs, identified wildflowers, and dug a few holes. Then Norah got brave and waded out to a sandbar. 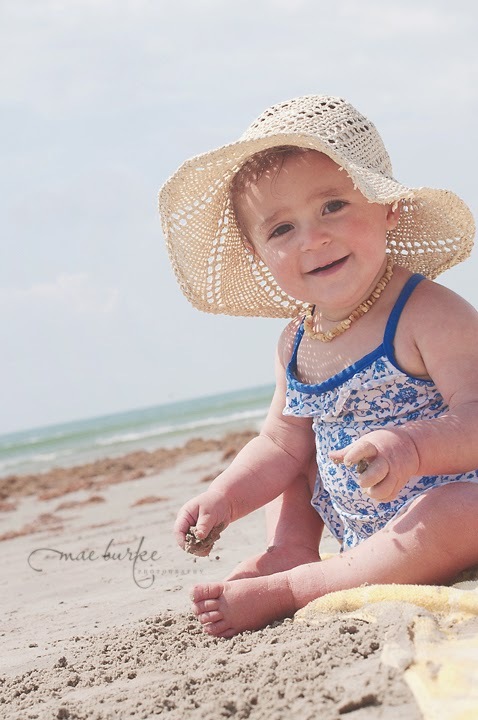 The sand was soft that day and her little chubby body sunk fast with each step. I watched her patiently, expecting her to need me to catch her from falling at any moment. But then, she remembered. She dug her plump fingers into the wet sand and began rubbing them on her legs saying "Mama! It feels so good on me 'kin!" and I won't pretend that I didn't cry. Jesus scooped me up in that moment proclaiming His sovereignty as the Living Water. I know that I often get caught up in thinking about the woman at the well and imagining babies in third world countries dying of thirst, but this time, I understood His picture of living water so much more. See, the chlorinated, harsh water that dumps from our tap can visibly clean Norah, but it does little to heal her. Christ is like this salt water. Teeming life that not only washes away our filth, but deeply refreshes our spirit and heals our wounds! Salvation has brought me this flowing gift, and today I am grateful for it.